splice: Black has one eye in the corner. threatens to capture and kill the eye there. 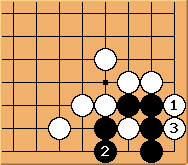 captures the white stone but White extends to and Black has one false eye and one real one. Dead. Would this work? You take away one of Black's eyes, and also have a net to run him into? unkx80: This will work too. victim: But it will give B an extra ko threat. The first solution is better. 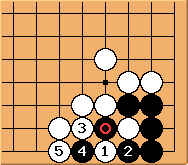 Thurisaz: Does this not assume that B is stupid? 2 at 3 would negate that and absolutely secure the eye too, no? 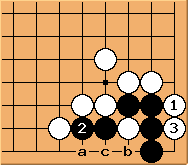 ProtoDeuteric: If black played at , then white would play at the in the diagram and falsify the other eye, thus killing black. at , although securing the smallest eye possible in the corner, does not guarantee life for the group. Again there is a ko threat at 'a' getting the reply at 'b'. Actually, even if White ignores the ko threat and doesn't play 'b', the best Black can do is capture the two white stones on the edge which, with a throw-in, leads to a false eye. So the latter diagram isn't even one threat for Black. Thus surely White should prefer this one. Shaydwyrm: Black can get extra ko threats by playing this way instead of as in the "What About This?" diagram. 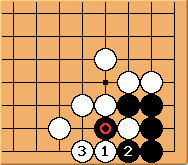 Now a is a threat (b is the response), and cutting also becomes a threat, maybe a real one rather than just a ko threat depending on the outside situation.